There are a few components that go into creating confidence at corner entry. One huge competent is your visual skill. I’ve spoken before about the benefits of good visual skill in a broader sense, but in this article I wanted to speak specifically on how correct and well executed visual skill can help build confidence at corner entry, so that you can begin using the large amounts of untapped potential you know you aren’t using. When referring to corner entry, most people will be referring to the point where you begin steering and leaning the bike into a corner. However, an important aspect that creates confidence (and speed) as you enter a corner takes place BEFORE you reach the point where you want to begin steering. If you’re trying to increase your entry speed but you’ve already lowered it too much before you reach your entry point, there’s nothing you can do to get that speed back. So, a vital part of increasing entry speed is to arrive at corner entry with MORE speed. This is done through your actions in the braking zone. From a vision point of view, good visual skill in this area slows things down and allows for a better judgement of speed because you’re giving yourself more time and attention to deal with setting it. As you’re coming down the straight you will be looking out for your braking marker (the point where you want to begin braking). 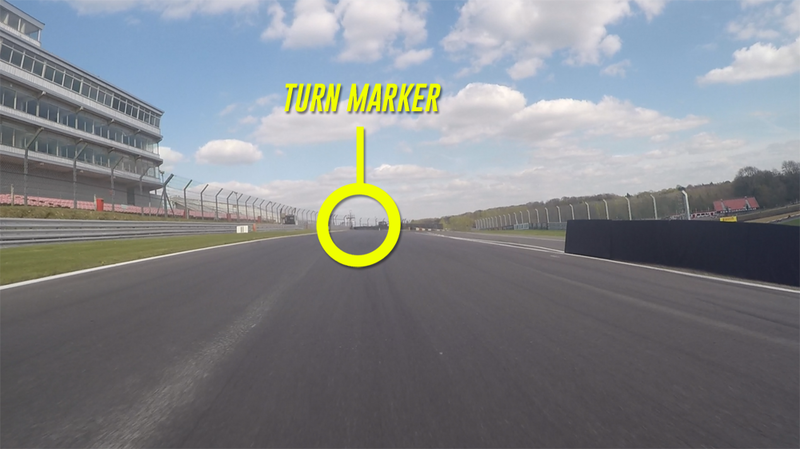 As soon as you reach that point and begin braking, all you have to do is flick your eyes from that point down toward the corner to find your predetermined turn marker/entry point. If this is something you’ve not been doing, I think you’ll be surprised at just how much composure this brings in the braking zone, particularly in the heavier braking zones. It gives you a much better idea of just how much space you have to play with and it helps you make better decisions when it comes to speed setting, allowing you to stop that tendency of decelerating too much through fear and panic. As a side not to the above, try not to tunnel down too much on the turn marker you have set. Seeing this one marker/object coming toward you at great speed could have the opposite effect of what you’re trying to achieve, and if the corner ahead is on the faster side you may unnecessarily overbrake. Instead, try to judge your speed on the corner ahead, not purely on the marker itself. You can do this by flicking your eyes into the corner on your approach so that you’re fully aware of the turn marker you want to hit, but you’re also better aware of how much space (and therefore speed) the corner is offering. With this improved view from your braking point and as you approach your turn point, you should be able to make better entry speed decisions and, ultimately, work to incrementally increase your corner entry speed more effectively. So at this point on your approach you’ve done a better job of setting your speed for the corner because of the greater awareness of speed and space you now have. The next step is to ensure you don’t panic and overbrake as you make your way into corner entry by continuing to hold a good view of the track ahead. Much like moving from your braking point to your turn marker, you’re going to do something similar between your turn marker and your apex. Once again it’s quite simple… When you’re sure you’re going to hit your turn marker (usually a short distance before you hit it), move your head and eyes into the corner to find your apex. This routine is going to help you stay composed and roll the extra speed you’ve arrive with into the corner. Now, this doesn’t have as big an effect on your entry speed because like I said, your speed is largely set before you arrive at your entry point, but it’s a good way to stay aware of the space you have. If you DO lose too much speed however, it’s your vision and the signals you get in this corner entry phase that is going to help you fix that next time. For instance, if you correctly hit your turn marker but can see you’re reaching the inside of the corner too soon and/or getting the feeling like you’re now going too slow, this is a big indicator that there’s potential there for a higher entry speed. So while it won’t change your speed on the current run through the corner, it provides you with information about the potential that’s there so that it can be better tapped into next time. Running more speed into corners is tough if you’re rolling off very early, using very little brakes and coasting a long way up to the corner. If this is you, you need to first build confidence to use more braking potential so you can build up a good “surplus of speed”. Once you can begin braking later and using more braking potential, you’ll find it easier to roll more of that speed into the corner because you have more speed to play with. When you roll off and use very little brakes, your options for taking more speed into the approaching corner are very limited. This incredibly simple visual plan may not seem like much, but it can make the world of difference for a rider that isn’t already practising good visual skill. If you’re frequently finding yourself in the situation where you’re not arriving at the corner with enough speed and you KNOW there’s potential there, working to correctly time where you put your attention is likely going to help you see improvements and reduce frustration. Not only that but it’s going to help you make better decisions in general too. Not just with your speed, but with everything else that goes into corner approach and entry.